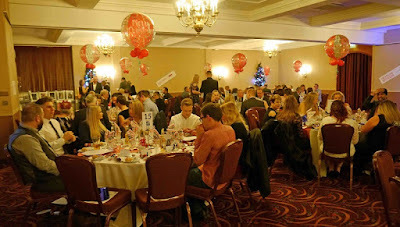 The Barnsley & Rotherham Chamber Annual Christmas Dinner, attended by 150 guests, raised over £1,000 for local charities. Guests attending the Christmas dinner helped to raise funds in support of the Chamber's Charity of the year, City Hearts, and the President's Charity Fund through a tombola and raffle, which saw prizes donated by Chamber members. Held at Tankersley Manor in Barnsley and sponsored by NPS Barnsley, Mears and MKB Solicitors, guests took part in the event which included entertainment from award-winning comedian Lea Roberts. During the evening over £1,200 was raised, with £720 being donated to City Hearts and a further £550 being raised for the Chamber's President's Charity Fund. In addition to raising funds on the evening, the Chamber is calling on its members to donate warm clothes and gifts which help the vulnerable individuals supported by City Hearts. Donations can be made at the Chamber's Rotherham office based at Genesis Park, which is acting as a collection point for donations. Jenny Gilpin, founder of City Hearts, said: "We rely on the generosity of supporters and are grateful for the donations made. All proceeds raised at the Chamber event will go towards our Christmas Appeal, where for many of the families with us, this will be the first Christmas they have spent safe and loved in a long time. The donation will help us to bring the gift of hope to special families this year. "City Hearts was founded to support and empower vulnerable individuals including those who, through no fault of their own, have become victims of trafficking or entrapped into modern slavery. We would like to sincerely thank everyone who purchased a raffle ticket on the night as well as those who have donated clothing to our Christmas Appeal." Andrew Denniff, Chief Executive of Barnsley & Rotherham Chamber, added: "We've enjoyed a successful twelve months, during which time we have welcomed new members of staff to the organisation, seen our membership grow and despite difficult trading conditions for many of our members, there seems to be renewed optimism in many areas as we look towards 2018. I’d like to take this opportunity to thank all of our members who have supported our events programme this year and for the generosity they have shown in helping those who are less fortunate. "At this time of year, we believe it is more important to give than receive and I would like to thank all of our members who attended this year’s Christmas Dinner and donated so generously to a very worthy cause. We held a few more festive events throughout December, helping to increase the impressive total raised on the evening."